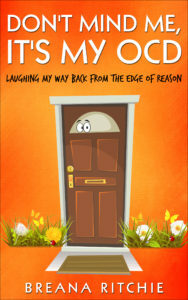 Don’t Mind Me, It’s My OCD is an engaging portrayal of how author Breana Ritchie navigates her way through daily life amid the roadblocks of Obsessive-Compulsive Disorder. Despite the serious nature of OCD, Ritchie has woven in a generous sprinkling of wry humor, highlighting her preferred method of coping with this disorder. From childhood through present day, you are invited on the journey with her and will gain a sense of the anguish, humiliation, and suffering that go hand-in-hand with OCD. You will also delight in the determination, absurdity, and comic relief that uplifted Ritchie into acceptance and a sense of well-being as she continues to co-exist in amicable fashion with this complex disorder. Whether you have experienced mild to debilitating OCD symptoms, or simply want a deeper insight into the life of an OCD sufferer, you will appreciate the positive, hopeful tone this book presents. What you won’t find is medical jargon, nor will you be inundated with dark passages or saddled with the heaviness that often accompanies this disorder. Ritchie’s words of wisdom at the end of the book offer her favorite ways to alleviate symptoms, which will resonate long after the book is finished.